Was sent the wrong battery initially. Called Tayna, no problems. The swapped the wrong battery with the correct one at my convenience. A little annoying but it worked out in the end. Would highly recommend Tayna and Westco batteries. The previous Westco battery lasted 7.5 years. 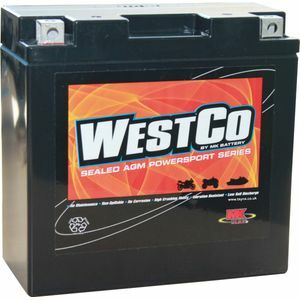 I've never had a Westco battery but this one is excellent. The engine turns over and starts instantly. My XJR 1300 is now put away until the Spring except on Christmas Day when I start her up and run her on the centre-stand for half an hour. I am confident she will start first time as well. Tayna service is excellent too. I ordered the battery on a Friday morning just before 1000 and it arrived the following morning at just after 1200. Great work by Tayna and Yodel. st time then as well. Third time I have ordered from Tayna - very fast delivery and very competitive pricing - will definitely use them in the future. Very good battery, last one lasted 6 years. Holds a charge really well. Battery fitted about three weeks ago, so far no problems, My original battery wouldn't start the bike if left more than a couple days. NO such problems with the new battery. have left the bike for over a week and fired up first time.